Renoise 3, Sound Tracker from Renoise. Nonstopbeats's review"Review of Renoise 3"
Renoise is one of the best tracking sequencers currently available and has now just launched it’s latest version. This version incorporates a selection of new features which have been added to the tracker and does away with some of the older fixtures. In this review we will take a look at the tracker and will also outline why it may be a good choice in modern music production. The Renoise 3 sequencer is different from other sequences in that it creates patterns consisting of note and velocity data in a downwards fashion. This can be confusing at first if you're not used to the Renoise style in which to work. However, after a little bit of practice it will make your workflow incredibly quick. Renoise has a number of colored strips in the main window and each one represents a track in which you can create sounds. This may seem a bit confusing at first but I quickly worked out the layout. Each track can also be effected by a range of different effects that come with the Renoise program. These include reverbs, EQs and compressors, as well other more creative effects such as distortion and flangers. Sounds in Renoise 3 are used either from samples which are dragged into a sample window and then programmed into the tracker via keyboard input, or via plug-ins that use digital synthesis and can also be input into the tracker sequencer. 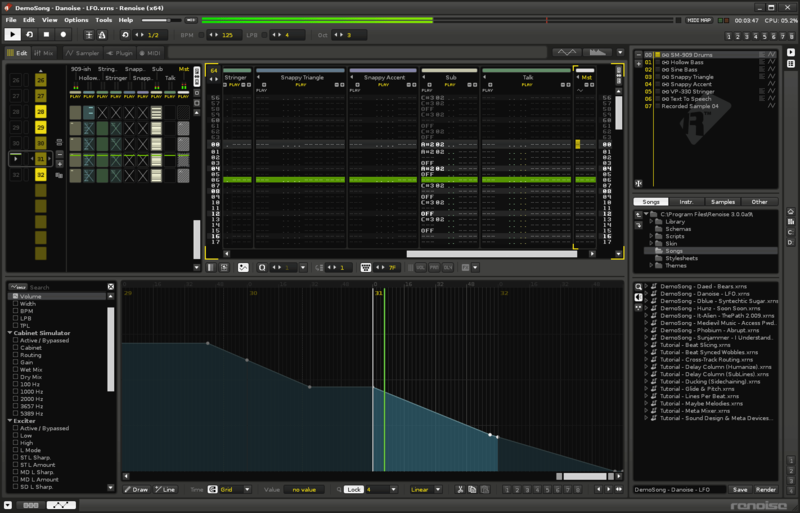 Renoise is especially good with samples and can be used to edit and modify each sample that you bring into the program. This includes the ability to chop up samples and map them across the keyboard, as well as the ability to create volume fades on each sample. I found it easy to adjust the sounds of samples so that they fit well within the track. The new version of Renoise works in both 32 and 64 builds. Certain features within the interface of Renoise have also been changed and the original sample envelopes have been discarded and a new set of modulation groups have been introduced. These carry out the same tasks of modulating the basic values within a sample, such as resonance, cut-off, pitch and panning but also introduces more advanced modulation such as LFO and tracking of the velocity. The aspect that I enjoyed the most about Renoise was the fact that it was very easy to get basic patterns up and running within the sequencer. Once you have learned how to lay down a pattern by importing samples then this becomes easy to do. I also enjoyed the quality of the sound engine within the program, and was impressed by the crisp and bright sound that it had. The built-in effects also have a high level of quality and can make the music sound punchy and dynamic when the compressors and the various EQ devices are placed onto individual sounds. What I did not like about Renoise was the fact that some of the functions are hard to find and doing simple tasks, such as automation also proved to be tricky. I also found that documentation on how to use the program was limited and only a few guides were offered on the web. Luckily I had a friend who is well versed in the program and he was able to show me some of the things that I didn't understand. Other trackers are also available on a selection of different platforms that are also styled as tracker sequencers. One of the most popular is that of Nanoloop. This advanced tracker sequencer is available for a selection of different platforms, including mobile devices such as Android and iPhone. The Android version is the latest release of this software and allows you the ability to create complete tracks which you can then save onto an SD card. This tracker is not a replacement to Renoise but is instead a fun alternative. It features 8 different channels which can be sequenced using a sample or a synthesizer, as well the ability to have 8 different patterns between each channel. Renoise 3 is a sequencer that may seem complicated at first, but it quickly becomes understandable. Users will quickly see the software as an intuitive sequencing tool. The sequencer is especially good for sequencing, editing and automating audio samples. With the ability to edit and process each individual sample that you bring into the Renoise application. This program is not as sculptural as other sequencers and is probably more suited for electronic dance music. However, I still found it to be easy and effective with a wide range of different styles. If you enjoy creating electronic music and want a stable tracking sequencer that is filled with effects of different ways in which to sequence and edit samples and digital synthesizers, then the latest version of Renoise is a good choice. TreDay's review"The King of Trackers"
Renoise is available for Windows, OS X, and Linux. Installation is a snap, with no dongles or online authentication license managers. After installation, configuration is straightforward--You setup your plugin folders, and ASIO/MIDI devices in the preferences menu and then you’re ready to go. It’s important to note that Renoise only allows you to have 2 folders designated for your plugins which can be a problem if you don’t have all of your plugins installed in only 2 folders. Learning Renoise couldn’t be easier. Not only does the website have a fully documented wiki that covers every function, there’s also a free official tutorial video series that walks you through the creation of a song. Furthermore, the community has a heritage of sharing their song project files, which you can play back inside Renoise and see everything that was done to produce the song. I’ve owned Renoise for over 2 years and it’s been my sequencer of choice for that duration. Before that, I used trackers like Buzz for a decade as well as more traditional DAWs such as Reaper on occasion. Like Buzz, Renoise is a tracker. In a tracker, you place notes vertically to create patterns and then arrange these patterns to create your song, somewhat similar to Ableton Live’s Session View. Trackers also rely heavily on computer keyboard shortcuts and while at first glance it seems daunting, trackers have an extremely intuitive workflow for sequencing MIDI and sample-oriented music once you're accustomed to the interface. It’s almost like using a hardware sequencer as you quickly input notes by using the arrow keys to go to the line you want and then use your computer or MIDI keyboard to place notes on that line. I find this to be far less tedious than dragging, copying, and tweaking tiny midi blocks on a piano roll. That said, the tracker interface is not ideal for every kind of song. Because Renoise doesn’t have audio tracks or a linear sequencer, it’s difficult to sequence long audio clips together like multiple live instrument parts. Furthermore, it doesn’t have multitrack recording in any capacity, so recording bands, ensembles, or live drums isn’t possible. Renoise does support ReWire, however, so it is possible to use Renoise for sequencing your soft synths or samples and then rewire Renoise with another DAW that is more suited towards handling recording. The sample editor in Renoise is fairly robust. You can place markers on drum breaks to slice them, set loop points, record samples through your audio interface, and set key zones to create layered sample based instruments. You can even draw your own waveforms, process them with effects, resample, and then use that as an instrument, essentially creating a completely unique synthesized sound from scratch. There’s built-in capability for modulating sample parameters and there’s a beat sync feature that will automatically transpose and fine tune your samples so that their length syncs to the current BPM, making it easy to achieve that classic pitched up jungle drum sound. Renoise is capable of loading 3rd party plugins (VST/AU) and has a built-in 32-bit to 64-bit plugin bridge for handling those older plugins. Also included is a standard suite of processing effects, the usual array of EQs, reverbs, compressors and delays. These are all very usable and the cabinet simulator in particular is a favorite of mine. It features 17 emulations of well known guitar amp cabinets and adds some really nice dirt to synths and drums. The program itself is very responsive. Nothing is bloated or sluggish and I haven’t encountered any CPU spikes or instability. The interface remains snappy, even inside large projects. CPU usage will be dictated by which and how many plugins you use, Renoise doesn't utilize more than 3% on my Intel i5 2500k @ 4.5ghz while idle. A large project featuring 25 tracks and assorted effects might climb up to around 20% while playing, but again, this will vary heavily depending on the plugins you use in your song. One of the greatest assets for Renoise is the community. They’re active and helpful, even creating powerful free tools with the official scripting language. These tools range from things like arpeggiators and step sequencers to the incredibly useful “Guru,” a tool for programming hardware synths and saving patches (even for synths that don’t have patch memory!) inside Renoise. Another thing to note is that the developers are very fair when it comes to releasing updates for Renoise. 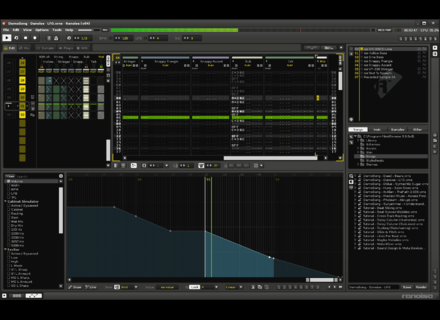 Between Renoise 2.0 and 3.0, the developers released many significant updates for free over the course of 4 years. These updates included things like an Ableton Live style Grid/Pattern Matrix, an official scripting language for user made tools, new effect plugins, and full 64-bit support. While it may not come with all of the pack-in synths or gigabytes of sample content that many DAWs boast these days, Renoise is a powerful, stable, and fast sequencer with a great community and a spectacular price at around $90 USD. It's a specialized sequencer with a focus on midi sequencing and small samples, so it's not the kind of program you'd use for every song you might want to produce, but if you’re not satisfied with your current DAW workflow or if you want to try something completely different from the usual big name sequencers, you should definitely give it a try. - Isn't ideal for sequencing numerous long audio clips. Renoise 3.1 has arrived, integrating all features from Redux and adding a few long-requested features and workflow enhancements.